This incredible ranch home is in Quail Valley and offers 3 bedrooms, 3.5 bathrooms, a 3-car garage, and an amazing finished, walkout lower level. 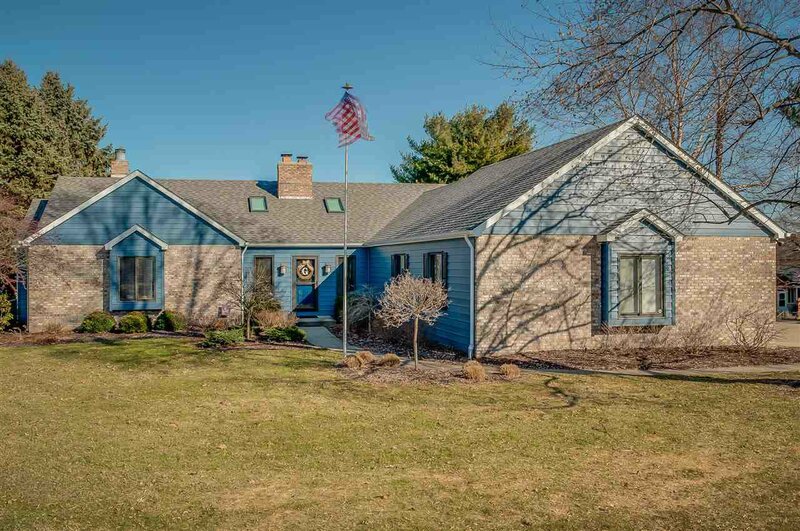 It is in the Penn School System and sits on a lovely corner lot. The foyer of the home opens into the living room and features a vaulted ceiling, eye-catching brick fireplace, and hardwood flooring. The open floor plan has multiple sliding doors and windows, creating an abundance of natural light. Off the living room is a versatile formal dining/office. The kitchen includes a center island, casual dining area, tile backsplash, built-in desk, tile flooring, access to deck, and nearby half bath. The main level master suite is spacious with a vaulted ceiling, two-sided fireplace, shelving, walk-in closet, slider to deck, and bath with tile, jet tub, double sinks, stand-up shower, and an additional sink. The second bedroom has carpet and door to a full bath. The walkout lower level is an entertainer's dream - large rec room with fireplace, built-in shelving, and great wet bar with fridge. An additional bedroom has a daylight window and access to full bath. Laundry room has tile and space for storage. Unfinished area adds more storage and has a walkout double doors to the backyard. Attached 3-car garage with epoxy floor, heater, ceiling fans. Lovely backyard is partially fenced with fire pit, play set, stairs up to decks, waterproof storage shed under deck. Recent updates include new roof, siding, facia, gutters, gutter guards, water softener, tankless water heater...Call to see today - won't last long!